The average mortgage payment for new loans in Vancouver rose by 4.5% year over year in the fourth quarter of 2016 to $1936 per month. Canada Mortgage and Housing Corp. says the fact that the average scheduled monthly payment is growing faster than inflation is concerning because it suggests that homeowners could struggle to make their payments going forward. Homeowners are getting creative to keep up with record debt levels, now 167% of disposable income. Homes are being converted into ATM Machines. “Homeowners with significant unsecured debt are currently able to refinance this debt through a second mortgage or home equity line of credit (HELOC)” claims personal bankruptcy firm Hoyes Michalos. Naturally this is keeping delinquency rates incredibly low. The number of people filing for either a consumer proposal or bankruptcy that owned a home fell to just 7% at the end of May 2017. A massive drop from the all-time high of 35% in February 2011. Of course, this scheme of turning shelter into an endless ATM is a result of surging home prices. Vancouver home prices are up over 40% the past two years, while Vancouver condo prices are still increasing by Over 2% per month. This will ensure the money tree continues to grow, especially important considering Canadian real estate has become the number one contributor to household wealth. 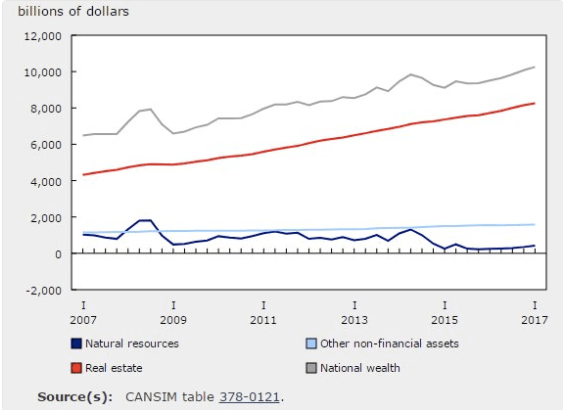 Canadian Wealth Mostly from Real Estate. With real estate the number one contributor to Canadian wealth, and a key source of financing our lavish lifestyles, it seems unlikely the Bank of Canada will hike interest rates anytime soon, despite their hawkish comments yesterday.